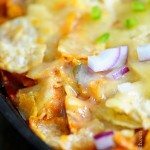 This Chicken Fajita Nacho recipe will become one of your favorite ways to enjoy fajitas! Made of chicken, peppers, onions, cheese, and salsa all piled on top of nachos! 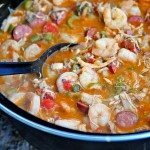 I love making quick, simple suppers throughout the week and even on weekends. It seems like suppertime sneaks up on me more regularly than it should and those are the nights that I definitely try to put a meal on the table that my entire family will love. 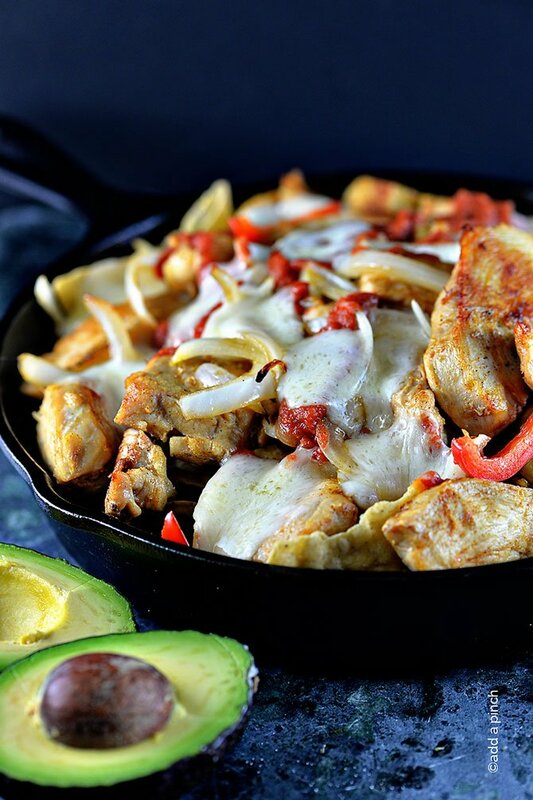 This is by far one of our favorite chicken fajita recipes – in nacho form! Everything is cooked in the same skillet for really easy clean up, too. That makes this a definite win-win weeknight meal in my book. What am I saying? Even if I have time, I’d rather not spending it washing dishes! First, I begin with the chicken. You can either use chicken tenderloins or just slice your chicken breast into long slices. I cook it in a skillet with a bit of olive oil until it is cooked through and lightly browned. Then, I remove it to a bowl while I saute my peppers and onions. Once they’ve cooked to the point that I want them, I remove them to the same bowl with the chicken and turn off the heat to my skillet. 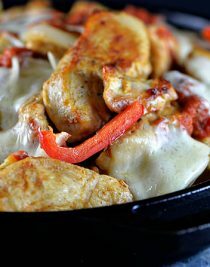 I add my tortilla chips to the bottom of my skillet and then layer on my chicken, peppers, onions, and cheese. I then just pop the skillet under the broiler for a few minutes to allow the cheese to get all bubbly. Talk about delicious! 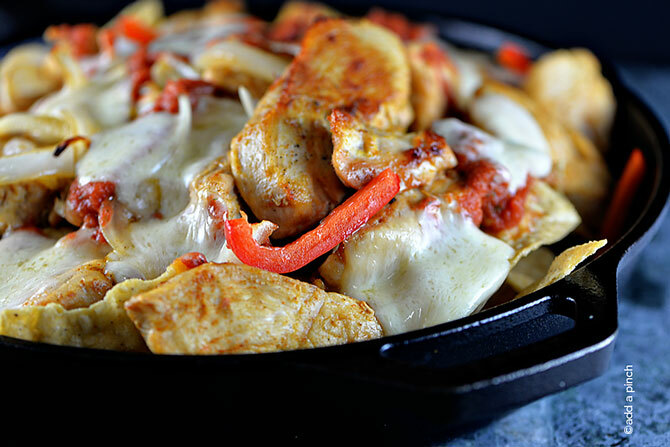 Here’s my Chicken Fajita Nachos recipe. I hope you love them! Preheat oven to broil at 500º F.
Drizzle olive oil into a skillet over medium heat. Add chicken strips and cook until cooked throughout, about 5-10 minutes. 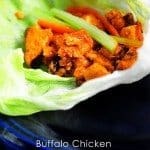 Remove chicken from skillet and into a bowl. Set aside. Add onions and peppers to skillet and cook until slightly tender, about 3 minutes. 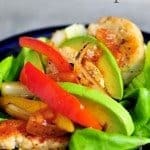 Remove from skillet and add to the bowl along with the chicken. Turn off the heat to the skillet. Arrange tortilla chips in a layer on the bottom and up the sides of the skillet. Add cooked chicken, onions, and peppers to the top of the tortilla chips. Top with cheese and place into the preheated oven. Broil until cheese has melted and turned slightly bubbly. Remove from oven and top with salsa. Serve immediately. Sounds and looks really good. Thanks Robyn. Have a Great Day and Week! I love your website and I have tried many of your recipes. Just a quick question. When do you use the taco seasoning in the above recipe? Sounds yummy and I can’t wait to try! Thanks so much. I’m so glad you are enjoying the recipes. 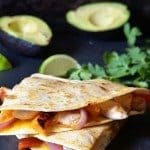 For the chicken fajita nachos, you’ll want to add the taco seasoning to the chicken and the onions and peppers either as they are cooking or once they’ve cooked. I’ll update the recipe to make it more clear. Thanks so much for letting me know! This looks fabulous! I may have it for lunch and dinner! I agree, this really does look good!! You know I’m pinning it!! oh I really want these nachos, like now…they look so delicious! 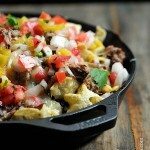 This has to be one of the best nachos recipes I have ever seen! Everything looks so fresh and tasty, plus it’s made with chicken…thanks for sharing! When do you use the taco seasoning mix? It isn’t mentioned in the directions, but is listed in your ingredients. I am guessing you sprinkle it on the chicken while it is cooking? Thanks for all the yummy recipes! Yes, so sorry for the confusion.